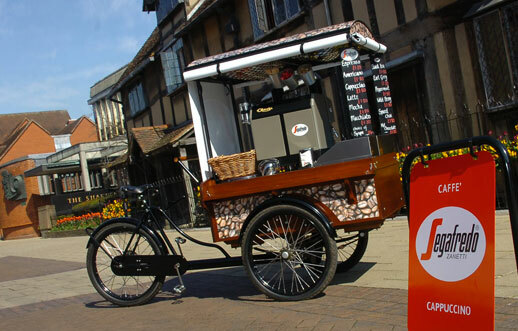 First we profiled the conference bike, then the pub bike, followed by the delivery bike, so a natural progression would be a barista bike… the Bikecaffe. Founded by a couple of coffee connoiseurs, Steve and Mike, they took it upon themselves to provide what they felt was missing in the marketplace – a mobile, outdoors-oriented third place. “We saw a gap in the market for alfresco (outdoor) coffee to cater to the backlash against global coffee chains. People don’t like queing inside a shop for an overpriced undermade coffee. Not only that, but of course the bike-powered coffee shop is practically carbon-free, not to mention its offerings are free-trade and provided in cups made of recycled materials.